PHOTO: Allen Ramsey, DWCPhoto.com. The Highlands Bluebirds finished state runner-up in the Class AA race Saturday. The Highlands Bluebirds cross country team has had problems putting together its best race in the state meet in previous years. But on Saturday at Kentucky Horse Park, Highlands ran the Class AA race in an average of 16 minutes, 34.83 seconds to finish with 71 points. Unfortunately, the North Oldham Mustangs ran a few seconds faster averaging 16:28.81 to win the state championship with 61 points. Highlands finished third last year behind North Oldham and Webster County. "We ran so bad last year to get third and that was a disappointment," said Brian Alessandro, Highlands Head Coach. "This year, we ran as well as we could have. There's nothing more I can say how proud I am of the guys. They did really, really well. This was one of the best Highlands teams in history. You can't take anything away from that. This team would win most years." The Mustangs have won the Class AA crown six straight years and seven of the past eight. The last time North Oldham did not win Class AA came in 2009 when county rival South Oldham won it. Highlands won its last of three state championships in 1985. "They have a strong program," Alessandro said of North Oldham. "They have a good middle school feeder (program). They're solid. They're going to be good ever year. They got it done. Hat's off to them. It just stinks to lose by 10 points and get second." Highlands senior Ethan Shuley repeated as the 2A individual state champion in 15:33.47. Shuley won the title in 15:58.14 last year. He battled various injuries this year. "The season has been tough," Shuley said. "A lot of training has gone into it as well as overcoming personal adversity. I got injured so many times and came back." Shuley outran the runner-up in North Oldham senior Trenton Fryman by just more than 13 seconds. Mustang junior Alex McClarty finished third in 15:53.35 before Highlands senior Geoffrey Mearns took ninth in 16:24.81. That put the Bluebirds behind the Mustangs by five points. After that point, the third, fourth and fifth runners from North Oldham outran Highlands by at least one place. Mustang sophomore Mason Beard took 14th in 16:42.25 before Bluebird senior Matt Gray came across at 17th in 16:51.98. "I feel good," Gray said. "We didn't get quite where we wanted. But I think we're real happy. We'll use this experience and move on." North Oldham senior Aaron Kay-Anthony edged Highlands senior Will Backschieder by two seconds at 16:58.19 to 17:00.35. The fifth runner from North Oldham in senior Zeke Gillette edged Highlands senior Jackson Paul by .09 seconds, 17:03.43 to 17:03.52. Highlands has six seniors in its top seven. Highlands junior Colt Parris finished 68th in 17:52.12 and senior Michael Long finished 75th in 17:58.5. "It's been very fun and very encouraging," Paul said. "We pushed each other along and gave each other a lot of encouragement. It's always been fun running with them every day." 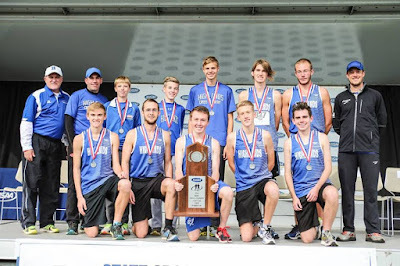 Five boys teams in Kentucky history own 10 or more state championships. 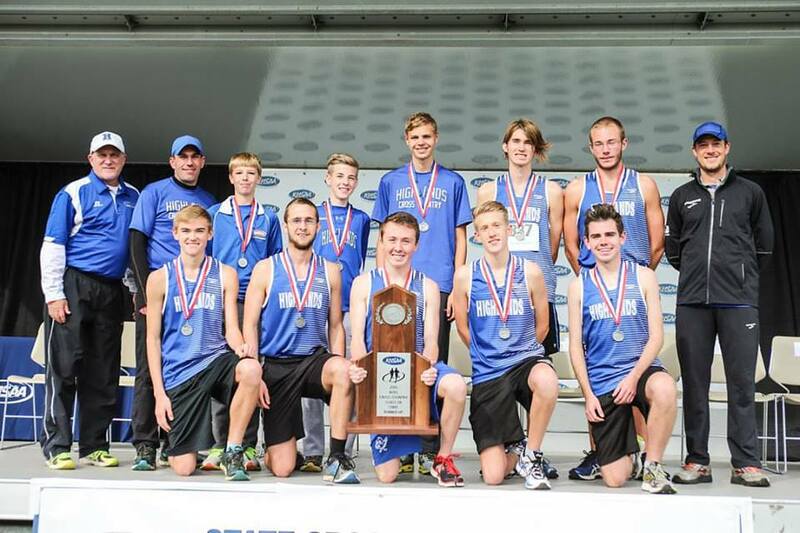 Louisville St. Xavier captured its state record 21st title winning the 3A race. Shuley also excels in the classroom and the community. He recently won the male nomination for the National High School Heisman award.